A millwright suffered a severe face laceration as a result of an accident he had while operating a portable, hand-operated, high-pressure pump, commonly known as a porta-power. The pump was rated for 10,000 PSI operating pressure. (Side note: Of the ten hand-pumps inspected at his company only three of them were fit for service). The porta-power was attached to a ram (cylinder) via a high pressure, flexible, rubber hose. He was using the porta-power to pump high pressure oil into the ram to position a heavy load. Apparently, when the ram was almost all the way out, the threaded connector, attaching the hose to the porta-power, unexpectedly failed. The reaction of the heavy weight pushing the shaft back into the ram forced the oil to flow out of the open end of the hose at high velocity, causing the hose to whip violently, striking him in the face. Unfortunately, this is yet another accident that can be written-off to ignorance. An inquiry into the root-cause of the accident, provided evidence that the failed connector, which should have been rated for 10,000 PSI operating pressure, was in fact a black-pipe connector rated for a maximum operating pressure of 250 PSI! Evidence also proved that the victim did not have the knowledge to detect the difference between a 10,000 PSI connector and a 250 PSI connector. In addition, the subject porta-power was not equipped with a vital safety asset - a pressure gauge. This meant that the victim had no idea what the pressure was before, or at the time of, the failure. Even if a porta-power is equipped with the proper hose, connectors, and ram, a person is vulnerable to an accident because of the failure to monitor pressure. For example, a porta-power, with the appropriate attachment, is a useful tool for pushing/pulling a bearing off a shaft. The pressure gauge can be used to "see" if and when the bearing breaks loose. The absence of a pressure gauge means that the operator may increase the pressure to a level which could cause the shaft, or the attachment, to fail catastrophically, resulting in severe injury or death to the operator or persons nearby. The forces generated by a porta-power and its attachments can be extraordinarily high. Thus, it is imperative, for the sake of safety, that personnel using a porta-power, and its attachments, know what the pressure and force limitations of the devices are. - execute a safety inspection of a porta-power, hose, connectors, pressure gauge, and attachments. 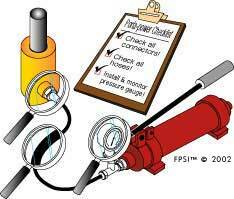 - read a pressure gauge, and relate the pressure to force. Install pressure gauge adaptors on all porta-powers. Certain types of adaptors can facilitate a pressure gauge with no more than a few turns of a connector. Have all of your porta-powers checked for safe and proper operation at least once a year by a factory authorized technician. Allow only trained, authorized personnel to operate a porta-power. Have the suppliers of porta-power attachments provide written operating and safety information, and training. Have your safety department include porta-power safety training in their training curriculum. Do not remove or paint over cautions and warning labels applied to a porta-power or attachment by the manufacturer. Replace worn or damaged warning or caution signs immediately. Certain attachments used to pry or force loads can put extreme tension on metal. 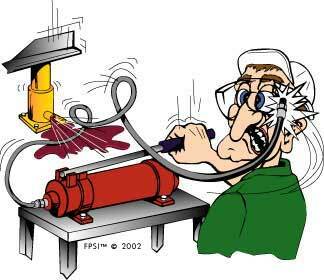 If the metal should slip, or break loose, it could put the operator, or those close by, at risk of "flying" metal. Have the attachment supplier recommend if protective "cages" are necessary for their products. Wear safety glasses whenever working on or around a porta-power.